Located on Israel's southern Mediterranean coast, the new Ashkelon SWRO plant will provide around 15% of Israel's domestic needs. 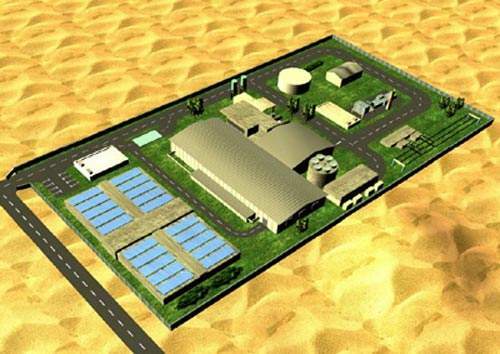 It is the first of a number of similar large-scale seawater desalination facilities planned. Design drawing of the new Ashkelon plant. Producing 100 million m&#179;/yr of desalinated water, it is the largest facility of its kind in the world. The plant holds 40,000 membrane elements in 32 reverse osmosis (RO) treatment trains over four floors and uses optimised, multi-stage RO and boron removal procedures. Simplified diagram of the process. Operational reliability and continuity have been heavily prioritised throughout the design. Artist's impression of the finished plant in situ. It occupies an area of 75,000m&#178; and includes its own gas turbine power station to provide the facility with a dedicated electrical supply. Israel has a chronic water resource problem - North Africa and the Middle East is the world's most water-scarce region. 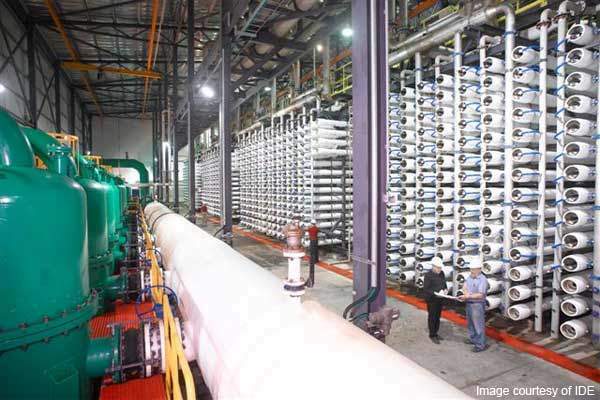 Israel's Desalination Master Plan - a major initiative to double desalinated water production to 400 million m&#179;/yr - arose in response. Producing more than 100 million m&sup3; of water/year, the Ashkelon SWRO plant is twice the size of the current next largest facility of its kind. The plant uses a three-centre design to maximise efficiency, reliability and operational flexibility; the comprehensive mathematical modelling performed on the entire system during the design stage enabled commissioning to be fast and straightforward. A dedicated gas turbine power station was built adjacent to the desalination plant; an overhead line provides a second supply from the Israeli national grid. The facility comprises two identical plants, each consisting of a pumping centre which feeds 16 RO banks. The complete installation holds 40,000 membrane elements and uses optimised, multi-stage RO and boron removal procedures. Ashkelon produces around 13&#37; of Israel's domestic consumer demand – at one of the world's lowest ever prices for desalinated water. It has been suggested that it could be many years before this plant's achievement is matched. 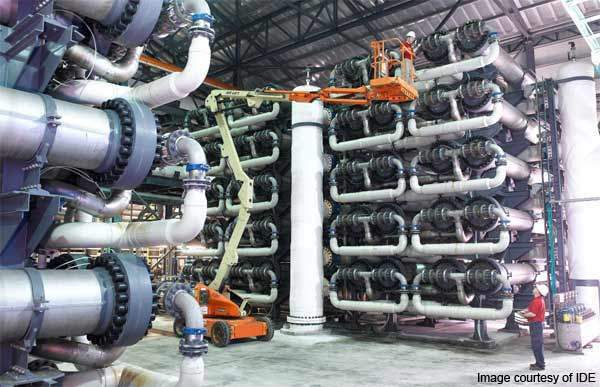 With a capacity of 330,000m³ per day, the plant produces around 13% of the country’s domestic consumer demand at one of the world’s lowest prices for desalinated water. The plant’s output has increased gradually since its inception, producing 101 million m³ in 2006, 104 million m³ in 2007, and 111 million m³ in 2008. The large scale of the plant presented a number of technical challenges and necessitated a shift from the more familiar arrangement of several identical outsized trains seen in smaller reverse osmosis (RO) installations to a three-centre model. "With a capacity of 330,000m³ per day, the plant produces around 13% of the country’s domestic consumer demand." 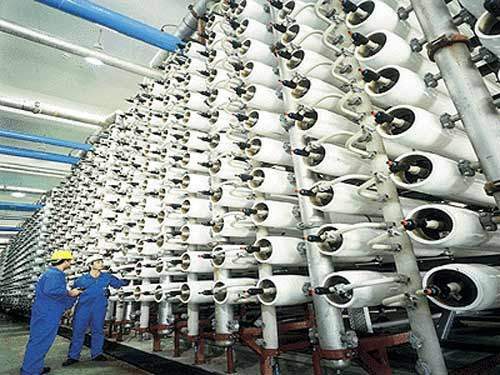 The project included membrane desalination units and facilities for seawater pumping, as well as brine removal, raw water pre-treatment, and product water treatment. In addition, the scheme required construction of workshop and laboratory buildings, access roads, and a dedicated gas turbine power station. Built by VID, the total project cost was $212m and was funded by a mixture of equity (23%) and debt (77%). The overall revenue over the period of the contract will be in the region of $825m. In common with other countries in this water-scarce region, Israel has chronic problems over water resources, which the 2000 Desalination Master Plan set out to address. This called for the construction of a series of plants along the Mediterranean coast, to enable an annual total of 400 million m³ of desalinated water to be produced by 2005, chiefly for urban consumption. According to the plan, production is intended to rise to 750 million m³ by 2020. 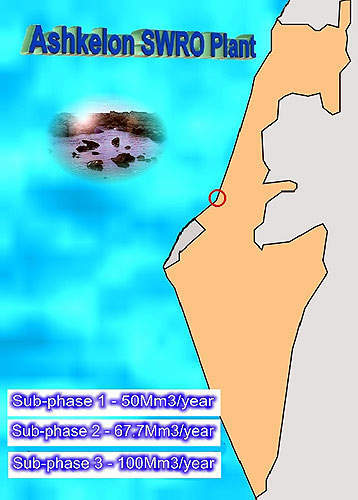 The contract for the Ashkelon facility was awarded in September 2001 after an extensive tendering process beginning in July of the previous year. Concession was granted on a build-operate-transfer (BOT) basis and at the end of the 25-year period, the plant transfers to the Government of Israel. Originally intended to produce 50 million m³/year, after the formal signatures were completed in November 2001, further negotiations were entered between February and April 2002 to double the output. This second agreement was signed in April 2002 and work on the two-phase construction programme began a year later. A three-centre design model was adopted for this plant, which involves arranging the high-pressure pumps, energy recovery devices, and membrane banks so that they can operate independently and flexibly. Separating the high-pressure pump from the energy recovery device and breaking the link between pump capacity and the RO bank capacity enables the process to be optimised for each of the constituent elements. This brings significant technological flexibility and high efficiency to the system while also reducing overall water cost, in this case to $0.52/m³. Two almost entirely self-contained, autonomous plants have been built on the site to provide twice the capacity first envisaged. Each unit contributes 50 million m³/year of desalinated water. 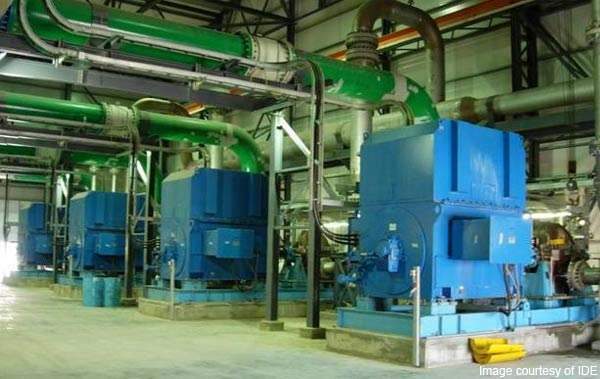 With the exception of the seawater intake, the product water treatment system and the dedicated power plant, the site sub-systems have been duplicated to ensure independence of operation. In addition, those elements have been designed with sufficient in-built back-up capacity to allow separate service to each plant. The North and South plants came online in September and December of 2005 respectively, each consists of a pumping centre comprising three-plus-one large 5.5MW high-pressure pumps, 16 RO banks that contain 105 pressure vessels apiece, and a common feed ring. Built over four floors, the facility comprises 40,000 membrane elements and uses optimised, multi-stage RO and boron removal procedures. An energy recovery centre made up of 40 double work exchanger energy recovery (DWEER) devices collects pressurised brine from each plant’s RO banks and reclaims the energy. The independent nature increases both the flexibility of the system and its overall efficiency. 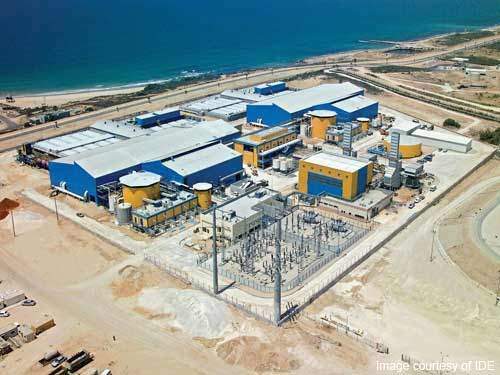 The whole facility occupies 75,000m³, located 700m north of an existing Israel Electrical Company power station. Using the station’s cooling seawater discharge was one of a number of intake options initially considered. However, it was ultimately rejected in favour of using an open, submerged type due to site constraints and hydrogeological limitations. The system comprises three parallel pipes, which safeguard supply and enhance operational reliability by producing non-turbulent feed water flows. High-density plastic piping that is simple to clean and relatively resistant to biological growth has been used to minimise maintenance. From the pumping station, raw seawater flows to the pre-treatment facilities through two separate lines. This ensures that the plant can at least continue to operate at half-capacity in the event of blockage or failure in one of the pipelines or static mixers. The dosing pumps at the chemical treatment facility are each equipped with real-time flow-rate adjustment and adequate redundant capacity has again been factored in to guard against down-time. 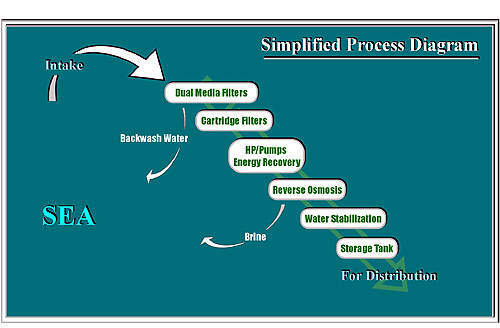 Filtration is performed in two stages, starting with gravity filters containing gravel, quartz, sand, and anthracite media. The combination of long residence time and a distribution system designed to minimise clogging and preferential channel formation helps achieve high filtration efficiency. 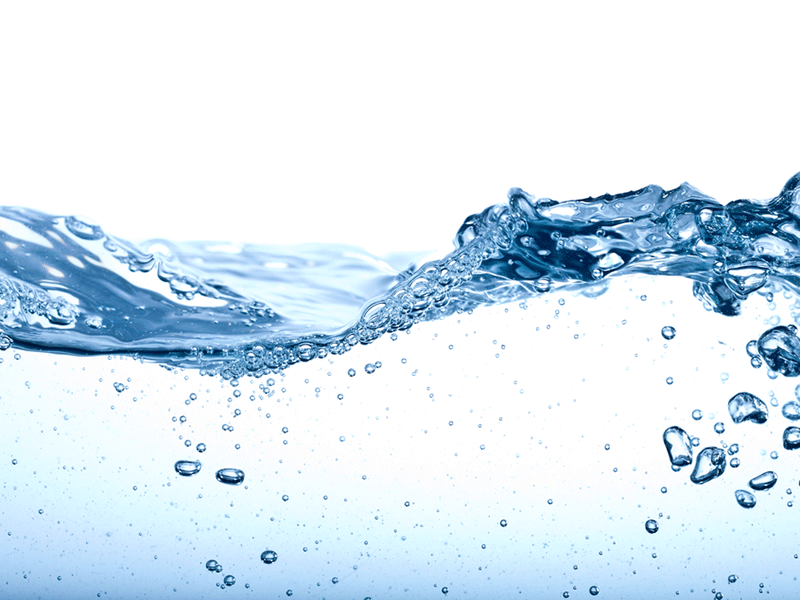 The filters have an automatic backwash facility to offer a 33% standby overcapacity. They have a proven ability to cope with storm turbidity levels. High boron ion reduction was an important design consideration. The method selected is highly flexible and readily adjustable to feed water temperature fluctuations, being capable of delivering a removal efficiency of more than 92%, when necessary. Coupled with a number of other key requirements including high pH tolerance, continuous low pressure operation, low membrane fouling and cost-effective, reliable performance, these demands led to FilmTec elements being selected for the RO operation. Post treatment with lime re-mineralises the product water, before it enters the national system. "The provision of a dedicated power plant is a major factor in both safeguarding operational reliability and reducing energy costs." To adhere with the project’s drive to ensure reliability, efficiency, and continuity of operation, electricity is provided from two separate sources. 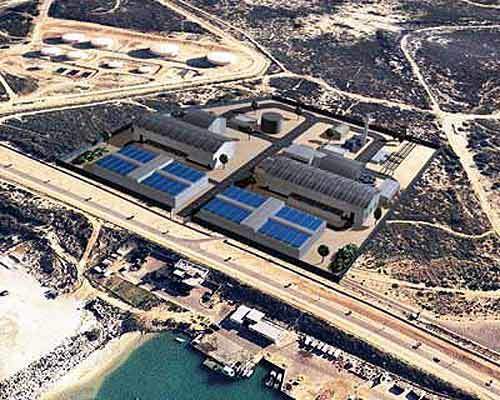 A dedicated gas turbine power station has been built adjacent to the desalination plant, while an overhead line provides supply from the Israeli national grid. The provision of a dedicated power plant is a major factor in both safeguarding operational reliability and reducing energy costs, as it is offers protection from daily or seasonal demand fluctuations. 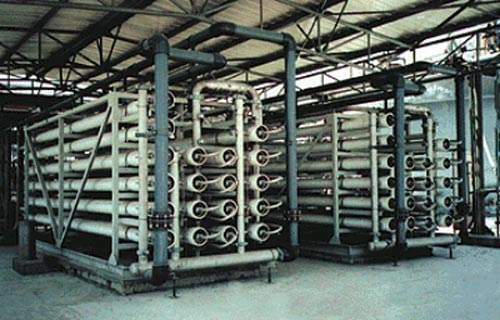 The desalination system is expected to run at a continuous base load for most of its operation. A contract was formally awarded by the Israeli Ministries of National Infrastructure and Finance on behalf of the Government of Israel. VID comprises IDE Technologies (50% and lead partner) and Veolia (50%). The engineer, procure, and construct (EPC) contractor was OTID, a joint venture company formed by IDE and OTV (Veolia Group). Israel Chemicals and Delek Group are equal-share partners in IDE Technologies. Operation and maintenance is the responsibility of Adam, a joint venture company of IDE and Veolia. The RO membrane elements were provided by the Dow Chemical Company, while the temperature and pressure transmitters were provided by Smar. Mekorot distributes the product water.